German town in the province of Hesse-Nassau; capital of the former duchy of Nassau. Schenk ("Gesch. der Stadt Wiesbaden") thinks that Jews lived there in the fourteenth century; but he gives no documentary evidence to support this view. There is no record of persecution of the Jews in Nassau, either in the Armleder riots (1338) or during the Black Death (1348-49). In the public peace ("Landfrieden") promulgated in 1265 by Archbishop Wernher of Mayence, together with the lords of Epstein, Falkenstein, and others, an allusion is found to "certain undisciplined persons who have arisen against the Jews contrary to God's command," and who are to be punished as disturbers of the peace. It is not said, however, that such disturbances actually occurred in any place in the duchy. A "Judengasse" in Wiesbaden attests also the early presence of Jews there. During the Thirty Years' war several Jewish families from the surrounding district, whose lives and property were in danger from the hostile soldiery, were received and sheltered in Wiesbaden; and when, soon after, their removal was insisted upon by the clergy, the latter were opposed by a considerable number of the citizens and officials, who protected the Jews. Indeed, a friendly sentiment towardthe Jews seems to have found its way among the population. In 1700 a citizen of Wiesbaden—Heinrich Tillmann König—took such a liking to the Jewish religion that he faithfully observed its ceremonies, although he had to endure much at the hands of the clergy for so doing. It is strange that about the same time, as Schenk asserts, Eisenmenger composed part of his "Entdecktes Judenthum" in Wiesbaden. For a long time the Jews of Wiesbaden formed only a small community and had no prominent rabbis, although now and again one is mentioned in collections of responsa. 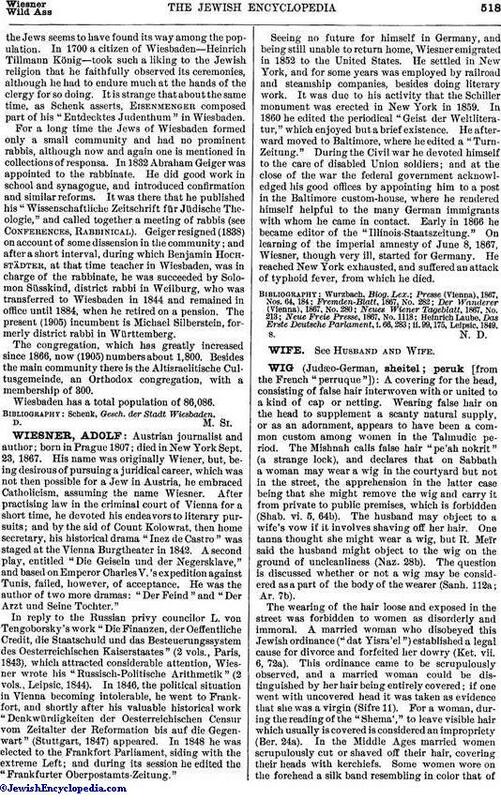 In 1832 Abraham Geiger was appointed to the rabbinate. He did good work in school and synagogue, and introduced confirmation and similar reforms. It was there that he published his "Wissenschaftliche Zeitschrift für Jüdische Theologie," and called together a meeting of rabbis (see Conferences, Rabbinical). 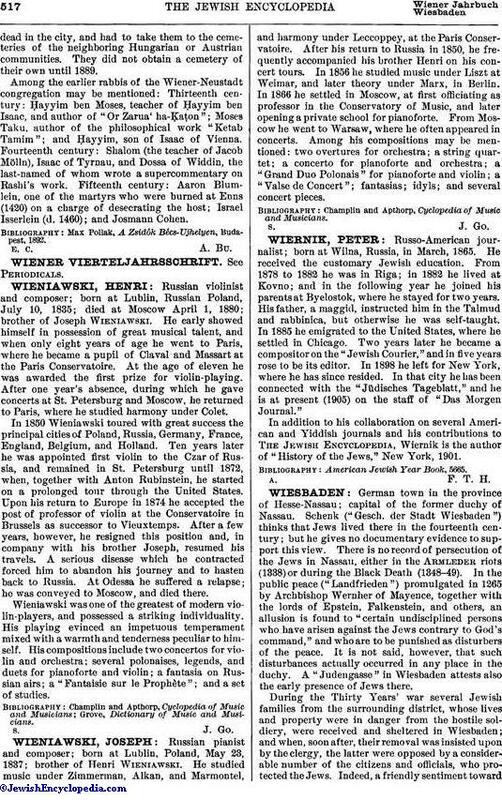 Geiger resigned (1838) on account of some dissension in the community; and after a short interval, during which Benjamin Hochstädter, at that time teacher in Wiesbaden, was in charge of the rabbinate, he was succeeded by Solomon Süsskind, district rabbi in Weilburg, who was transferred to Wiesbaden in 1844 and remained in office until 1884, when he retired on a pension. The present (1905) incumbent is Michael Silberstein, formerly district rabbi in Württemberg. The congregation, which has greatly increased since 1866, now (1905) numbers about 1,800. Besides the main community there is the Altisraelitische Cultusgemeinde, an Orthodox congregation, with a membership of 300. Wiesbaden has a total population of 86,086. Schenk, Gesch. der Stadt Wiesbaden.